Jonesborough Town Hall is located at 124 Boone Street, Jonesborough, TN 37659; phone: 423-753-1030. Photo: Christopher Taylor House, Main Street, Jonesborough, TN. 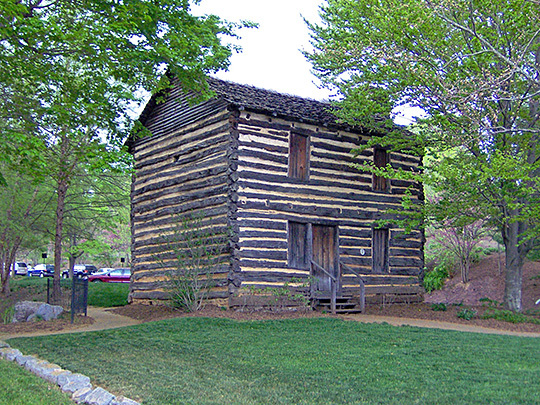 The cabin was built around 1777 a mile or so southwest of Jonesborough and moved to the city's main district in 1974. Listed on the National Register of Historic Places in 1971; removed from the National Register in 2009. Photographed by User:Acroterion (own work), 2008, [cc-by-3.0 (creativecommons.org/licenses/by/3.0)], via Wikimedia Commons, accessed February, 2013. Jonesborough, seat of Washington County, is the oldest town in Tennessee. It was formally established in 1779. It was named for Willie Jones [1740-1801], a North Carolina politician who was a friend of the settlers beyond the mountains. Many of the houses, churches and stores have changed little since pioneer days. Local people take great pride in their picturesque town and discourage the remodeling of the stores on the main street. Washington County, which included all the settlements in what is now Tennessee, was a political subdivision of North Carolina and the first in the United States named for George Washington. The constitutional convention and the first legislative sessions of the State of Franklin were held in Jonesborough until 1785 when the seat of government of the Lost State[†] was moved to Greeneville. In May, 1779, James Carter began to build the courthouse, a somewhat makeshift log structure with a shingle roof. From the beginning this was a planned community. No ramshackle cabins were permitted; the owner of each lot had to build "one brick, stone, or well-framed house, 20 feet long and 16 feet wide, at least 10 feet in the pitch, with a brick or stone chimney." Failure to comply with this provision brought forfeiture of the land title. The middle 1780s were years of confusion here. Many people refused to acknowledge the State of Franklin, preferring to remain loyal to North Carolina; two sets of officials attempted to establish their authority. The first Court of Magistrates of the State of Franklin dispensed high, middle and low justice — and in criminal cases some of its decisions were harsh. A horse thief was branded with an H on one cheek, a T on the other, and nailed to the pillory by his ears for one hour after which, they were cut off. In 1788, at the whipping post in the public square, a woman received 10 lashes for petty larceny. The penalty imposed upon a man guilty of this offense was 30 lashes. Andrew Jackson, then 21 years old, rode into Jonesborough in May, 1799, and hung out his shingle; he practiced law here about two years and boarded at the home of Kit Taylor, two miles west of town. When, in 1815, a rumor reached Jonesborough that Andrew Jackson had killed the whole English army at New Orleans, and had set sail to take possession of England itself, the townspeople were thrown into a frenzy of pride. Jonesborough was the home of William and Matthew Atkinson, who designed the Great Seal of the State of Tennessee ca. 1801. † In 1784 a number of counties attempted secession from North Carolina and attempted to create an independent State to be called Franklin.